I first heard The Residents’ version of Satisfaction while at school and was immediately intrigued. I remember heading down to Flyover Records in Hammersmith and greedily buying several albums, not knowing what to make of them and getting hooked on Not Available. I followed them for 15 years or so, still not knowing what to make of their provocative, jarring, humorous soundscapes, even seeing them perform The Mole Show at Hammersmith Odeon in the 1980s, before somehow losing interest. Then, one day I bought their Demons Dance Alone CD and was hooked again, buying more albums including Animal Lover some eight or nine years ago. I listened to it once or twice and found it impenetrable. The Residents’ trademark has always been weirdness – accessibility is not one of their biggest qualities – but I just couldn’t get into it, so the album sat on my CD shelves gathering dust. Then, several years ago, I stumbled on a remarkable YouTube video of a Residents’ song called My Window created by Virgil Pink. The animation is stunning, but the music is so poignant, the song referring to pets that have passed on. I wondered which album it was on and was stunned to see that it was on Animal Lover, already sitting on my shelves. Now, five years ago, we lost our two cocker spaniels unexpectedly within about 13 hours of each other. We knew Felix was deteriorating with age, but Bosley had just passed his annual check-up: we were devastated. My Window touched a nerve here. Another song, Inner Space, possibly tells of a woman visiting her dying father in a hospital or home (that’s my interpretation, but I’m sure there are others). Having sat with my brothers in a hospital vigil as our Mum passed away, again this song touched another nerve. The CD version I have includes a hardback booklet, not only with lyrics and illustrations but also with separate stories relating, possibly, to the songs. In the case of Inner Space, it’s about a mouse fed by a woman who comes to visit a man in a building. 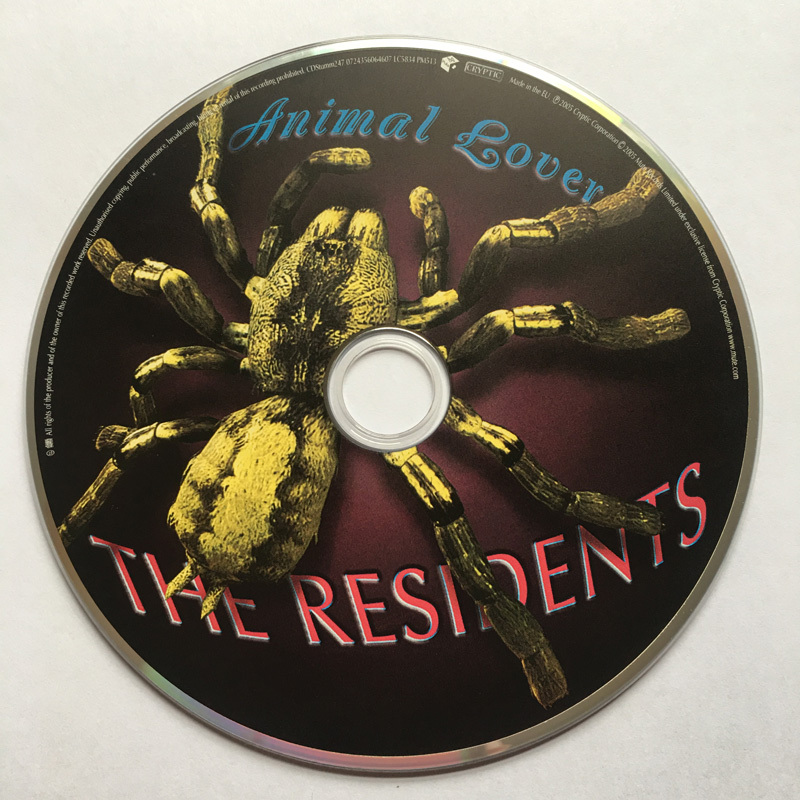 The Residents are visual as well as musical and performance artists and the book adds yet another dimension to the music. There is also a Virgil Pink video for this song. All of the 15 songs and accompanying stories and illustrations reflect in some way human and animal relationships and contrasts. Apparently, the songs are based on the noise mating patterns of animals, but, apart from the album title, I wouldn’t have guessed that. As expected from the Residents, the subjects of the songs are not light and will not be to everyone’s taste – a bit like Private Eye magazine cartoons – but although there are some trademark distorted lyrics and jarring guitars and other instruments, the music is surprisingly mellow. When I bought Animal Lover, my Mum’s illness was taking greater hold and I travelled regularly to see her. My usual cheer and resilience were drained and perhaps I did not have either the energy nor understanding to appreciate Animal Lover. I don’t suggest that this is the case for anyone else. I have played several of the songs a lot recently and this morning played the album in its entirety, the music sounding so sweet. I wondered if I was meant to wait to appreciate this album or maybe it was waiting for me. Animal Lover is one of a small number of albums and books that I have been unable to get to grips with first off, then left for years, only to discover afresh with new appreciation and enjoyment. Like most of the Residents’ work, it is not easy, but is worth listening to if you do find you appreciate it. I’m glad I do, even after such a long wait. Posted in music, books and writing. ← Epic sagas of the future or historical footnotes? I am not familiar with this group but I know well how different music resonates at different parts of one’s life. I am watching my mother in law’s health decline-I may well investigate this music and see if it speaks to me. They’re not always an easy listen, but I know what you mean about resonating. While my Mum was ill, I listened a lot to a song called the Western Sky by Justin Hayward of the Moody Blues. It was inspired by thoughts of how he shared a room with his late brother as a child, looking out on to the hills of Wiltshire, west to the Atlantic and his musical heroes. I used to play this while driving up the main road in that area to visit. I haven’t played it for a while. Perhaps it has worked its magic. I find music and songs helps when loved ones are going through illness or death. Sometimes it doesn’t connect until sometime later. While I haven’t heard of this group either, you now sparked my interest. Yes, it comes from all manner of different places without us knowing. I never heard of this group before. Inner Space spoke to me, it has a nice vibrational quality to it. Thank you for sharing it. I’ll be listening to that one more and looking for more songs by them. I know all forms of art helps one heal and grow. I never heard of Residents but the little I listen it seem to seperate out my feelings of being possible lost. Stop in from Ultimate blog challenge. Thanks, Dora. Will pop in soon. Thank you for introducing me to something new Robert. I enjoyed watching both videos. You are right, the animation was amazing. Such emotion. I too have experienced hearing a song I love only to find out I had the album/cd for years! Glad you enjoyed them. I found I had stopped myself opening up to new music, so found it good to find new things again.